Friday 2 March 2001 - Hey! Today is 03/02/01. Wierd patterns. During the flight we share several jokes about the in-flight movie with the staff and enjoy two cups of Lion-brand coffee later we come to a gentle landing at HNL. Here's the panorama I took as we slowed to a stop. I take a moment to make a panorama of the airport with Honolulu, Waikiki, and Diamond Head in the background. We'd planned our travel times pretty carefully, and Isaac - already pretty tired and rambunctious - was to have slept as soon as we boarded our second flight. We explaned this and they said they'd book us on any future flight without penalty if we wanted to decompress on O'ahu. Hey, this wasn't a bad idea! 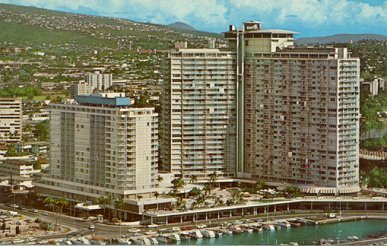 I jumped into a phone booth, and after a few phone calls had a room for us at the Ohana Waikiki Towers on Lewar Street, a half block from the Waikiki Beach. A few moments later we had tickets for the same flight 48 hours later, and we were off to take the Wiki-Wiki shuttle back to the main terminal, from which we could grab a cab downtown. Isaac crashes; a three-hour nap. Rose joins him while I explore the neighborhood. My Hawai'i travel guide is packed in my bag (as are all of our clothes, etc.) so I try and figure out where the good places to visit and eat might be. I walk around the corner to the Parc hotel, a rather expensive Japanese place, whose staff really know the area. Fifteen minutes later I leave with a handful of photocopied recommendations. (Next time I know where we're staying.) By the time he wakes it's early afternoon, and he's hungry. Prices for a la carte food are high, so we opt for a buffet. The Todai has been mentioned to us several times, so we head west, crossing Fort DeRussy., stopping at the U. S. Army Museum (with its Apache attack helicopter on the roof and American and Japanese tanks out front). Isaac loves climbing on the hardware, telling me how it makes "big boom". The buffet is on the Ala Moana Boulevard, only a few minutes walk further. Sushi, sashimi, hot food, salad, and desserts. Tasty. It's still early when we leave, so we head south to the water. We have no idea what to do or see; I figure taking a tour around Waikiki Beach would be fun. Ten minutes later we're looking at the harbor from the boardwalk in front of the Ilikai Hotel. (A passer-by tells us that scenes in the opening of Hawaii Five-O were shot here; it's supposed to be where Jack Lord stayed or lived or something. He's had a few. :-) Tiki torches, even when not lighted, get Isaac's attention. Then he sees an elevator scaling the side of the Ilikai; "Ikey need go up in elevator". The view from the top of the elevator's run, just at sunset as it happens, it great. We leave after enjoying a few trips and continue along the water's edge, just in time to see the weekly Friday evening fireworks. It's a short show, but loud, and exciting. Maybe too loud and exciting. He liked it while it was happening, but now he tells me "no more boom boom boom". We head in toward a tree strung with lights when we see an Asian girl dancing in a hotel meeting room. There's a lot of press covering her performance. A pop sensation? Nobody peering in has any idea. Do you know who this is? We resume, heading to the tree. It's being decorated for an upcoming event; there are videographers on ladders checking out angles and exposures in preparation for covering the event. We leave not knowing any more about the event than we did about the pop singer. So it goes. We get back to the hotel and Isaac announces "I need cake". Huh? I guess we'd mentioned the macadamia cream pie advertised by the Denny's across the street. So we go down and order a late-night cake (which is mediocre) and coffee (which is hot and tasty).